William H. Grueby (1867-1925) founded the Grueby Faience Company in 1897 in Boston, Massachusetts. Grueby was a ceramic artist who had been experimenting with more traditional styles when he traveled to Chicago to attend the World's Columbian Exposition of 1893. At that venue, Grueby was exposed for the first time to the new matte glazes being introduced by French artisans around that time. Upon his return to his Boston home, Grueby founded the company and began a period of about five years during which he experimented and perfected his own matte potttery glazes. Focusing mostly on art pottery vases, he introduced his first line of matte glaze wares in 1898; these were different than anything which had been on the market before, and colors of green, pink, aqua, and yellow were introduced in the new glazes. 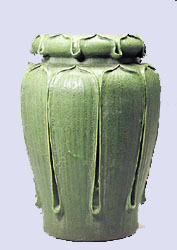 Of the new color glazes, the matte green most associated with Grueby pottery was the most unique and popular and to large degree remains so today. Soon thereafter, Grueby began working with other top artisans and manufacturers such as Gustav Stickley and Louis Comfort Tiffany. Stickley mission style Arts and Crafts furniture was a perfect complement to Grueby's pottery lines, and they were often displayed together in showrooms, expositions, and trade fairs. As further evidence of the synergies between these companies, Grueby lamps and vases were also featured in Stickley catalogues and in magazines devoted to mission style arts and crafts. While less obvious artistically, it is also interesting to note the pairing of Grueby ceramic lamp bases with Tiffany Studios glass lamp shades, a combination that is quite rare and highly collected in today's market. Like many manufacturers entering the industrial age, Grueby works were frequently copied, and much less expensive works were offered to a mass market with similar but admittedly inferior glazes. Nevertheless, the competition represented by the mass market production of similar glazes and styles had a major financial impact on Grueby's fortunes, leading to the bankruptcy of the company in 1909. Grueby emerged from bankruptcy shortly thereafter, and they continued to offer limited production runs of ceramic pottery, statuary, and tiles for another ten years before closing the doors in 1920. 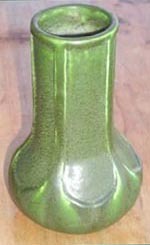 Buy Grueby, McCoy, Weller, Hull, and a wide variety of other unique ceramics on the Collectics Pottery, Porcelain, 50s & 60s, Art Deco & Art Nouveau, and Fine Antiques pages, or search the entire site for great antiques, collectibles, and crafts for every collector! Sell or consign period Grueby, Rookwood, Van Briggle, and other top American art pottery at Collectics, where we earn our customers' trust everyday! Read about our top performing national consignment program for estate and personal collections.